Weezer Says It's NOT Miller Time! 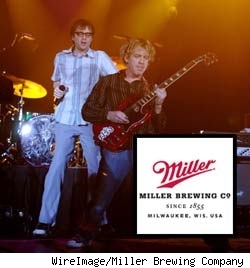 TMZ has obtained a lawsuit filed by the rock group Weezer against the Miller Brewing Company. The lawsuit, filed Thursday in Los Angeles County Superior Court, alleges the beermaker used the name 'Weezer' in several ads that ran in Rolling Stone magazine in 2004. The lawsuit also names Miller's advertising agency and the production company that laid out the ads as defendants. In the suit, the four members of the band (Rivers Cuomo, Brian Bell, Scott Shriner and Patrick Wilson) claim Miller used the Weezer name in the ads without their permission. The suit also claims the ads feature endorsements by other bands and musical acts with whom Weezer "do not wish to be associated with in any advertisement." Furthermore the lawsuit says the ads were "grossly misleading and deceptive" and they have been "damaged in an amount ... believed to be in the millions of dollars." Calls to Miller Brewing Company were not immediately returned. How Long Til the Weezer Reunion?